Perhaps the earliest written account of a labor action involved a work stoppage in response to an effective speed up — when it was announced that brickmakers would henceforth have the additional task of gathering their own straw. Already in the middle ages, there were predecessors of today’s unions, although medieval guilds were insular and elitist organizations centered around specific skilled professions. From the earliest colonial times, organized labor in America has created an inspiring history against sometimes desperate odds. For a brief but thorough and readable overview, see Labor’s Untold Story by Boyer and Morais. 1935 is often regarded as the beginning of modern American labor history. That year saw the passage of the Wagner Act, or the National Labor Relations Act. A centerpiece of the New Deal, the NLRA established — and the National Labor Relations Board was created to enforce — legal rights to organize, bargain collectively, and engage in concerted action. However these rights did not yet extend to employees in law offices. The other watershed of 1935 was the birth of the CIO (originally the Committee for Industrial Organization, later the Congress of Industrial Organizations). The founding of the CIO marked the beginning of a movement away from “trade” unionism, which divided workers along job lines. Trade unionism dominated the American Federation of Labor (AFL), which had been formed at the turn of the century. The new CIO, championed by new unions like the United Auto Workers (UAW), stood for “industrial” or “wall to wall” unionism. The egalitarianism of the CIO fostered not only more internal democracy, progressive politics, and solidarity, but also greater militancy. Eventually, in 1954, the AFL and the CIO resolved their sometimes bitter rivalries and merged into the AFL-CIO. On September 27, 2005, a new labor federation under the banner “Change to Win” was founded by several international unions that had recently left the AFL-CIO, and a couple that had not. Like the CIO before it, the new coalition emphasizes organizing the unorganized and maintaining a more critical distance from the established political parties. In 1972, Legal Services workers in New York City organized themselves without the assistance of any other, pre-existing union. They called their organization the Legal Services Staff Association because some members, mostly attorneys, were reluctant to call themselves a union. Nonetheless, LSSA was determined from the very beginning to be “wall to wall”, with every union worker in every legal services office in the city belonging to the same local, regardless of job description. LSSA was one of the very first unions to be organized in the legal profession, which had previously been thought to be virtually unorganizable. The protections of New York City’s local labor law at that time, unlike those of the NLRA, did extend to legal workers. In 1974 (the same year the Legal Services Corporation was founded), the Office of Collective Bargaining, New York City’s local counterpart to the National Labor Relations Board (NLRB), recognized LSSA as the sole bargaining representative for a city-wide bargaining unit (determined by the OCB) of legal services employees. The employer was known at that time as Community Action for Legal Services (CALS). In 1975, legal workers in a private firm in Boston won a decision in Foley Hoag & Elliott, extending the protections of the NLRA to workers in law firms. In 1977, employees of a Legal Services program in Detroit won a decision in Wayne County Neighborhood Legal Services, further extending the NLRA’s protections and NLRB jurisdiction to legal workers employed by nonprofits. This was tremendously important, because many places outside New York City, including numerous major cities with large legal services programs, did not have local agencies analogous to the OCB. 1977 also saw LSSA’s first strike and first contract. Legal Services management scoffed at the union’s first set of contract demands and refused to take the union seriously. When the workers went out on strike, management was so taken aback that the strike resulted in a virtually total victory in little more than a week. Among the union’s important gains was a contract provision staying any contested change in work rules through arbitration. This quick win may have fostered some unrealistic expectations about how easily future strikes could be won, but it gave a tremendous boost to union morale-not only in New York, but across the country, where workers in other legal services offices were attempting to unionize. That same year, 1977, LSSA members, who had began to take a central role in supporting the organization of other programs and coordinating communication among legal services unionists throughout the country, organized a conference in New York City. Representatives from some thirty programs, about half of them unionized, came to discuss mutual support and action. The resulting coalition continued to be coordinated from the LSSA office in New York City. In1978, the National Organization of Legal Services Workers (NOLSW) was formally founded at a convention in Detroit. NOLSW has helped to organize numerous additional locals since, and provides ongoing organizational support to existing locals. It now represents over 5000 members, in over 110 non-profits, including about half of the Legal Services workers in the country as well as employees of other nonprofits like Hull House in Chicago. Its members in New York City include advocates at the West Side SRO Law Project, Puerto Rican Legal Defense Fund, and Housing Conservation Coordinators. The president of LSSA, Jim Braude, was elected the first president of NOLSW. He held that office until 1985, when he was succeeded by another former LSSA president, Dwight Loines. In 2000, Dwight became political director of the UAW’s Region 9A, which includes New York City, and the presidency of NOLSW was taken over by Ellen Wallace from Boston. LSSA is one of the largest units within NOLSW, shares offices with the national organization, and continues to play an especially active role in NOLSW activities. In 1978, the LSC had introduced a reporting system requiring that extensive identifying information about each client be turned over to the LSC, which has no attorney-client privilege. Refusal to comply by an LSSA member in Harlem developed into NOLSW’s first nationwide campaign, and the reporting system was defeated. Such struggles on behalf of the clients and the programs, were to become a regular feature of NOLSW and LSSA activity. 1979, LSSA’s second strike began. CALS Executive Director at that time was Kathy Mitchell. She was insisting on a range of givebacks, especially of management’s ability to impose new work rules before arbitration. The subtext for the strike was whether Mitchell could make an example of LSSA, which was playing such a key role in the dramatic nationwide growth of unionization within Legal Services. The strike lasted 11 weeks through the winter. LSSA in those days had no strike fund and no hardship fund. Our only affiliation was to the nascent NOLSW, and it had very few resources to share. In the end, the union compromised on the implementation of new work rules, but we defeated other giveback demands, we won retirement benefits for the first time, and we made modest salary gains. Best of all Mitchell and her anti-union offensive were discredited, and she was dismissed. For years thereafter, her successor, Dale Johnson, always came to the table eager to point out first of all that he was not seeking give-backs. At a 1979 convention held during the LSSA strike, NOLSW voted to look for a larger union with which to affiliate. It was not just a question of drawing the lessons of the LSSA and wanting to participate in an organization with greater collective resources. There was also a growing sense, in the face of the threat to legal services from the Reagan administration, that connection to a larger organization would enable us to speak with more authority not only to management but to lawmakers. We sought a larger union that was widely recognized as democratically run, politically progressive, innovative and militant, and one that would accept affiliation while respecting a large degree of autonomy at the same time, in deference to the unique character of a legal workers’ union and its issues. We found a larger, more established union that met all these criteria, and was also prepared to be very generous and patient with a younger, smaller union like NOLSW, which would probably not be able to carry its financial weight for some time. The union was District 65. In 1980 NOLSW voted to affiliate with District 65, a diversified union originally organized during the thirties among the warehouse workers, stock clerks, and goods handlers of New York’s garment industry — who, like legal workers, had been considered unorganizable until they organized from within. District 65’s emblematic color was green in memory of a member who was killed by goons on a picket line during a month when a green button denoted that month’s dues paid. 65 was among the few unions to defy McCarthy’s committee, and among labor’s most outspoken supporters of the civil rights movement. Martin Luther King, Jr. called District 65 “the conscience of the American labor movement” because of its consistent commitment to progressive causes. In 1980, the same year that NOLSW chose to affiliate with District 65, District 65 itself decided to affiliate with a still larger union. Employing the same criteria that NOLSW did, District 65 picked the United Auto Workers (UAW). As one of the CIO unions, the UAW had pioneered the “wall-to-wall” unionism so central to LSSA. Among the UAW’s other claims to fame is the invention of the sit-down strike (Flint Michigan, 1948). The UAW was one of the pioneers of industrial, or wall-to-wall, unionism, and it is justly famous as the militant union which invented the sit-down strike. The UAW’s concerns with autonomy and progressive politics led the union to withdraw from the AFL-CIO for several of that coalition’s most conservative years, but it later reaffiliated. The UAW remains within the AFL-CIO, and has not chosen to affiliate with the “Change to Win” unions. Even more than District 65, the UAW proved from the beginning a devoted and invaluable ally in our political battles, including the fight to save Legal Services from defunding. The eventual bankruptcy of District 65 in the mid 1990’s — in large part due to the failure of membership numbers and employer contributions to keep pace with the cost of defined pension benefits for an aging membership — resulted in NOLSW becoming a direct part of the UAW as Local 2320. NOLSW was allowed to continue as a nationwide organization, one of only two UAW locals accorded that privilege. LSSA became a New York City “unit” of UAW Local 2320. In 1979-80, NOLSW’s second nationwide campaign was organized around the defense of North Mississippi Rural Legal Services. LSC was investigating the program for possible defunding at the instigation of local right wing elements including the Klan. Hundreds of legal services workers from all over the country converged on Oxford and Tupelo Mississippi and marched down streets lined on either side with hooded KKK counter demonstrators. The campaign culminated with a demonstration on Martin Luther King Day at the LSC headquarters. An NOLSW leaflet carried a caricature of LSC’s bowtied president, Tom Ehrlich, in a Klan hood and demanded, “Which side are you on?” In the face of embarrassing publicity, LSC’s investigation ended with a whimper, and North Mississippi Rural Legal Services retained its funding. Years later, the program’s employees voted to join the union, 52-0. In 1980, Reagan took office and within a few weeks mounted a “zero funding” campaign to eliminate Legal Services completely. The response by Legal Services management was ineffectual, and even indifferent to a large degree. Legal Services still exists because NOLSW, with the help of District 65, organized and fought a determined battle, from the streets to the halls of Congress. The wholehearted involvement of the UAW was decisive. Enough legislators were swayed to save Legal Services and to hand Reagan his first major political defeat since taking office. Throughout the 1980’s we continued to fight a series of battles against defunding, limiting the damage and keeping legal services alive. While the union won vital, if not complete, victories for our programs and our clients again and again during the 1980s, we won much less for ourselves. Our wages increased so slowly that we fell further and further behind other nonprofit public interest law offices. In part, this erosion was due to the lack of a seniority or “step” system. The decade of the 1980s was symbolically capped when, in 1990, Community Action for Legal Services (CALS) formally dropped its identification with the concepts of “Community” and “Action”, to become Legal Services for New York (LSNY). In 1991, with significant new funding available for the first time in years, LSSA determined to reverse the stagnation. After five months of contract negotiations without a serious offer from management, and three months without a contract, LSSA voted to strike on April 1 unless management made a serious offer before then. Management made no offer at all before the deadline, and the strike was on. Management negotiators slept or copied addresses at the negotiating table, pleaded ignorance of the issues, or went on vacation. They insisted on a mediator and then ignored her. The union, with tremendous support from District 65 and the UAW, a substantial hardship fund, and strike benefits that carried the members until unemployment benefits kicked in, we organized support among elected officials and others, raised money and paid hardship benefits, fed the members daily, ran a free daycare center, faced up to armed scabs and goons, did civil disobedience, finally took over local offices, and much more. After sixteen grueling weeks, management caved in. We rationalized wage scales on the basis of seniority, obtained unprecedented wage increases, eliminated discretionary raises, won a strong policy against sexual harassment, got retroactive pension contributions for our long-time members, and more. In 1993, management went back to demanding givebacks, including an attempt to undo the new step system of wages and to significantly reduce health care benefits. Their insistence prompted another strike. 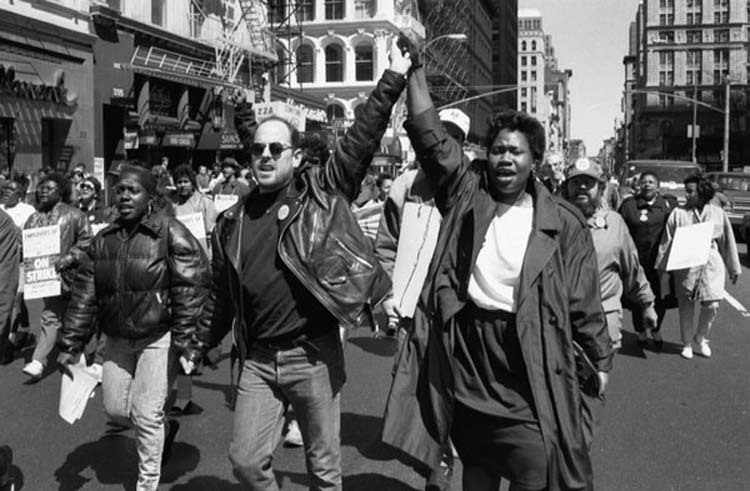 The 1993 strike, which lasted for a month through the winter holidays, was not characterized by the level of organization and preparation or broad participation that marked the 1991 strike, and did not make comparable gains. However, it was important, necessary, and successful in holding the line against givebacks. Holding the line against givebacks, especially in health care, continued to be a theme for the 90s, not just for LSSA, but for virtually all unions throughout America. 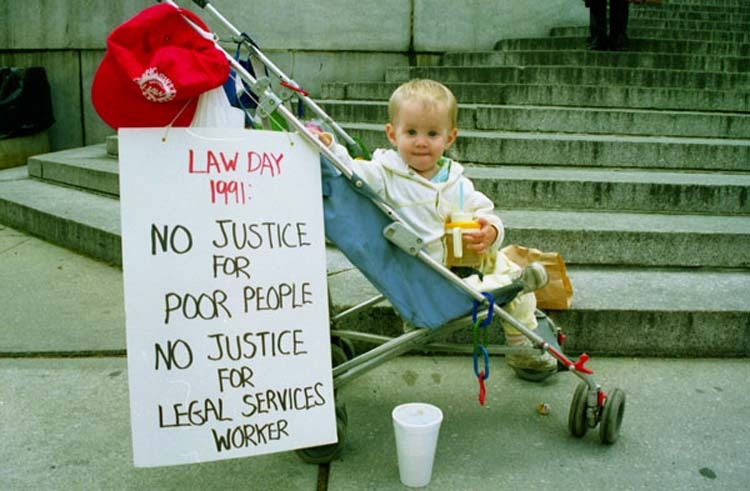 The mid-nineties also saw LSSA and NOLSW once again focused on fighting to maintain legal services for the poor. Once again, we were confronted with a sustained political offensive in Congress to destroy the effectiveness of Legal Services. This time it was not just about reducing funding, but about imposing substantive restrictions on our work and on client eligibility, among other things setting up programs to jump or be pushed from LSC funding altogether. Again, it was NOLSW that led the defense, and again, District 65 and the UAW were right there when we needed them. There was another front to the battle for maintaining client services, too. LSSA found itself fighting misallocations of resources, inflated management costs, and arbitrary and discriminatory layoffs, particularly at Bronx Legal Services, Bedford Stuyvesant Legal Services, and Brooklyn Legal Services Corp. A. Literally most of the union staff was laid off from Bed Stuy before renewed union pressure and a catastrophic project evaluation from LSC finally ended the 13-year reign of Cherie Gaines, the tyrannical and self-serving project director who had driven the program into the ground. Brooklyn A suffered perennial financial crises that resulted in layoffs in the mid-nineties and culminated in 2001 with the loss of most union jobs but no management positions. Other programs throughout the city also suffered layoffs, or narrowly avoided them through staff sacrifices, in some programs repeatedly. Also in the mid-to late 1990s, LSC began forcing the wholesale merger of legal services programs nationwide, and eventually ordered LSNY to start planning ways to consolidate and become more efficient. LSSA developed, and pressed LSNY to adopt, a restructuring plan that would integrate the system, improve the quality of services, enhance partnerships with community groups, and create accountability. LSNY refused meaningfully to address most of these concerns, and effectively dared LSC to impose a plan of its own. However, eventually LSNY did implement the current “membership corporation” structure allowing LSNY to force the firing of a project director as catastrophic as Cherie Gaines. Meanwhile, the opposite of planned integration of programs was occurring. Various local programs were working on their own plans to break away from LSNY, fragmenting the delivery of legal services in New York City even further, fragmenting our bargaining unit in the process, and leaving the LSNY-negotiated Collective Bargaining Unit behind them. LSSA responded to the threat by demanding, and winning in 2001, contract successor clauses to protect the union and its members in the case of disassociation. In 2002, two of the largest programs, Bronx Legal Services and MFY Legal Services disassociated. Bronx Legal Services did not survive, and its entire bargaining unit staff was absorbed into a new integrated program, LSNY Bronx. Most of MFY’s most experienced staff were absorbed into the newly created LSNY Manhattan, with temporary management and no board, matters which LSNY never got around to addressing. MFY kept the newer staff, who promptly organized their own sub-unit within LSSA. MFY began raiding other legal service programs’ funding and did its best to drive a wedge between its employees and the rest of LSSA, while setting out at the same time to bust the union at MFY with disastrous giveback demands and complete intransigence in bargaining. In an oft-quoted exchange, the MFY project director gave staff five minutes to decide whether they would accept her offer, whereupon staff replied “we don’t need five minutes”. 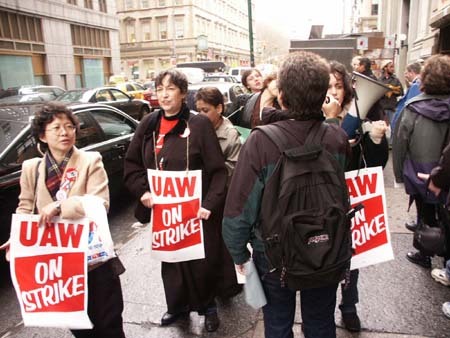 The 2003 strike lasted nine weeks. It was actively supported by the rest of LSSA, garnered widespread support, and ultimately produced a contract much closer to the union’s initial position than to management’s. More important than any particular provision of the contract was the dashing of Lynn Kelly’s hope that she could dictate to a smaller and less experienced bargaining unit. The next round of crises came quickly, in 2004-2005. Bed Stuy and Queens were threatened with further staff cuts. A central cause of both crises was the fact that neither local management nor LSNY could accurately figure out until it was too late — and they certainly could not agree — how much money the programs actually had to spend. Only a combination of intensive union intervention and more staff sacrifices averted complete disaster. In Harlem, it was worse. Without meaningful oversight or accountability, the financial malfeasance of the mostly-no-show project director Shirley Traylor had extended to include hidden accounts and practices that led the state to demand funding to be returned. Staffing levels plummeted, with according effects on client services. LSNY, and the remnants of Harlem’s board, insisted on non-intervention for long months. A campaign of mounting pressure by the union, supported by community constituents, finally led to Traylor’s resignation. LSNY’s response, over strenuous union objection, has been to force a consolidation of the so-far-solvent LSNY Manhattan with the financially unstable Harlem program, under that same remnant board that oversaw their program’s virtual demise — with no more direct oversight than before for Harlem, and less than before for LSNY Manhattan. The threat of further secessions remains very real. So does the threat of politically motivated funding cuts from without, and fiscal mismanagement and layoffs from within. Our union traditions have shaped not only our great struggles, but also our numerous smaller fights for better conditions, greater empowerment, individual rights, and collective justice. We have remained strong because we have been inclusive, democratic, progressive, and militant on behalf of our clients and ourselves. The challenge of rising to these principles is as vital now as at any time in our past.